Thank you for this story Rose. This is utterly horrendous. Other than Native American rituals I know of no use for tobacco. Which makes this even more horrendous. These children have a basic right to live, play, enjoy sunshine, food and life. These days corporate greed has made human life worth nothing. There are no throw away children or people!! Noted with sadness, thank you Rose. I agee with you Bridget childhood should be a carefree time. Great, although sad, article! One should think that the tobacco industry should be able to afford to pay, considering the enormous profit they make. thank you for posting Rose. Children should be allowed to be children and enjoying all the things children enjoy doing and not doing hard labour for long hours. Heart wrenching, thanks for a great post Rose.
" 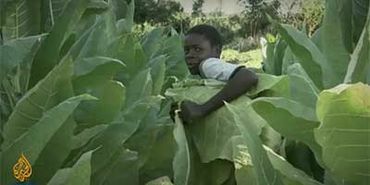 when the children cut and bundle the tobacco leaves they are put at risk of absorbing toxic quantities of nicotine through their skin. Many suffer from a disease called green tobacco sickness, or nicotine poisoning. Symptoms include severe headaches, abdominal cramps, muscle weakness, breathing difficulties, diarrhoea and vomiting, high blood pressure and fluctuations in heart rate. Some are even given the task of applying pesticides with their bare hands � chemicals when handled incorrectly can cause serious neurological problems." Other countires should ban products in which child labour has been used, so to force these other countries to stop this. Very sad that it's come to this. Noted and thanks.